The LA-based “Death Pop” duo will hit the road in February for over 25 dates in the US and Canada! 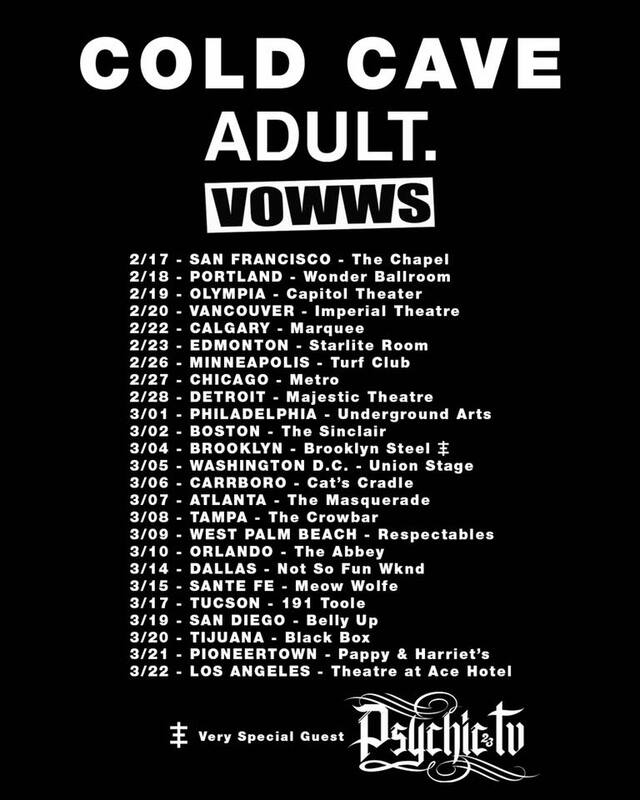 Fresh off the successful release of their latest single “Structure Of Love II” featuring Chino Moreno (Deftones), and their acclaimed performance at Paris Men’s Fashion week, VOWWS announce that they are joining COLD CAVE and ADULT. on the road for a late winter run of the US and Canada. The tour will take the bands up the West Coast, into Canada, and then drop down into Chicago to complete the rest of the stateside run. The tour coincides with the release of VOWWS latest single “Structure Of Love II” which premiered last Friday on Billboard. The track was co-produced by Danny Lohner aka Renholder (ex NIN, Marilyn Manson) and had the Deftones vocalist lending his talents on the microphone. You can check out the song on Spotify!